As we move slowly towards the end of Summer in the Sonoran Desert, I can sense Autumn in the air. Here at Kate’s Magik headquarters in the historic district of Tucson, many days still rise above 100 degrees and the occasional monsoon rain sweeps through and fiercely purifies all nooks and crannies of our town and desert. Yet early in the morning and late in the evening there is a touch of Autumn in the air - announcing its arrival in the September days to come. My Summer season was gentle compared to the prior months before the May album release of Pirate Radio. In early August, my partner Stuart and I took our annual camping trip into the wilderness, where flora and fauna once more soothed our souls and bedazzled us to the core - a necessary time out I recommend to all, especially the urbanites. In addition, I have been experiencing and exploring a burst of creativity with Kate’s Magik that has left me inspired and unstoppable; I have dedicated a lot of time to meditation and furthering my knowledge on natural perfumery, the expansive medicinal properties of Essential Oils and the practice of ritual and ceremony. Many exciting changes are brewing at Kate’s Magik. We are right in the midst of our new packaging launch and your favorite products will now feature new regal purple labels with gold and white accents. I am also planning to start a ”Perfume of the Month” club that will focus on different themes. In addition, after a long hiatus from working one-on-one with clients, I will be offering some personalized Ritual services and consultations. More info on my new offerings will be announced in a newsletter this Fall. Stay tuned! During my recent burst of inspiration, I reformulated two of my Anointing Oil blends. Today I want to re-introduce these oils that came to me in a waking dream, where most of my blends manifest themselves. The Anointing Oils simply known as Fertility and Eros never got the attention they deserved due to a lack of clarity in their meaning. 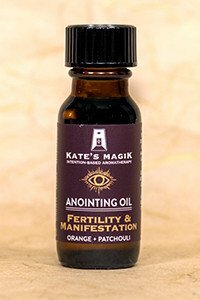 An inspirational blend to bring forth fertile energy to manifest new ideas & create miracles. In addition to musky, creative Indonesian Patchouli and sunny, inviting Sweet Orange I added grounding, purifying Cedarwood and a touch of Indian spice to tie it all together. The result is a magical scent that will help bring your wishes home. Inspired by mythology, a soulmate blend to help instill faith in the power of eternal love. 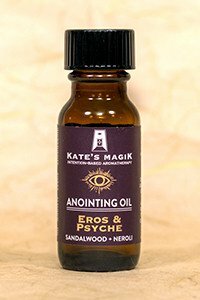 To evoke the spirit of beautiful Psyche I added Neroli, the alluring blossom of the bitter orange tree, to the original base of sacred Sandalwood (sustainably harvested in Australia) and Frankincense that represents Eros. The result is truly otherworldly. I hope that you enjoy these updated blends and move into the Autumn season with fertile energy, abundance and love in your heart. Hi! Don’t forget to Seize the day.